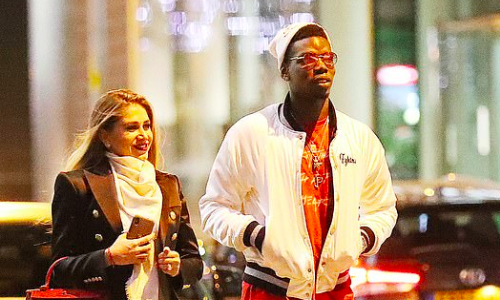 Paul Pogba and his girlfriend Maria Salaues celebrated becoming parents by dining out together at a plush restaurant on Tuesday night. Although the Manchester United star is yet to make an official announcement on social media, his lady love showed up with a flat tummy for the night out, as can be seen in the pictures shared by Daily Mail. Furthermore, Manchester United legend Bryan Robson revealed Pogba ‘seemed easy with things’ when they recently bumped into each other. “When I saw Paul last week in Dubai with the United squad, I had a little chat and congratulated him on the birth of his baby,” Robson, 62, was quoted as saying. And, he did appear in high spirits as he glammed it up to enjoy some downtime with Salaues. While Pogba showed off his athletic frame wearing white jacket, ripped pants and a cap of the same colour, his girlfriend looked absolutely stunning in a chic white ensemble over striped heels. Meanwhile, it remains to be seen if the 25-year-old will feature in Red Devils’ upcoming Premier League fixture against Brighton on Saturday.